I’ve been through a rough patch, which is why I haven’t posted anything in a long while. I felt depressed even though nothing bad had happened. In fact, good stuff was happening, but I couldn’t appreciate it. The new bed frame arrived, and we had proper nights’ sleeps. Our friends moved house. I posted all my Christmas cards, in order to use second class stamps. I don’t know what caused it, and I felt an ungrateful wretch, considering what has happened to other people around the world. Still, telling myself this didn’t help. Writing practise didn’t help. Morning Pages didn’t help. And I still wasn’t writing, not properly, not anything for anyone else’s eyes. I wasn’t walking much, either. I couldn’t get any time to myself, which always makes me feel claustrophobic and stifled. The days here have been grey. I think I lacked Vitamin D or whatever it is, the one you get from daylight. I felt sleepy all the time. Also (God, this sounds pathetic) I hardly got to watch anything I wanted on the telly. The latest series of Doctor Who whizzed by without me seeing it. I’m A Celebrity, Get Me Out Of Here seemed to last forever, as did Strictly Come Dancing and The X Factor. At this precise moment I feel, cautiously, alright. 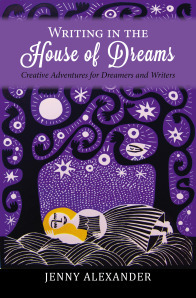 Still not writing, but I’ve come across an interesting book, Writing In The House Of Dreams by Jenny Alexander. It’s about recording your dreams, with a view to using them to create stories. I haven’t, as yet, fully absorbed everything the book has to say. I’m not sure that, ultimately, it will work for me. But it’s well written. And I’ve found writing my dreams down (when I can remember them) to be therapeutic.